In a recent issue of Pediatric Insights, Michael R. Czachowski, MBA, CNMT, NCT, PET, ASCP(N), R.T.(N)(BD) (ARRT), discussed the idea and the execution of the first portable Xenon-133 lung ventilation exam performed in the United States on a patient in a pediatric cardiac intensive care unit. Czachowski is the supervisor of the Nuclear Medicine and Molecular Imaging Departments at UPMC Children’s Hospital, where the groundbreaking procedure was performed. 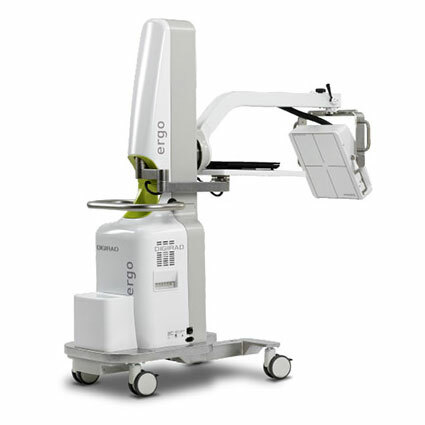 The process, which was implemented to allow technicians to perform portable ventilation lung exams in the CICU and to alleviate the need to move medically fragile patients to the nuclear medicine department, was made possible with the use of the Digirad Ergo™ portable nuclear camera. Ventilation lung exams the CICU were previously prohibited because of the inability to safely deliver the Tc-99m DTPA (diethylenetriamine pentaacetic acid) aerosol and the risk of radiation contamination. During a previous portable perfusion lung exam in the CICU, Czachowski’s team was questioned about the possibility of performing a portable ventilation lung exam. The challenge sparked some thought–and a lot of innovation among his team. Through much discussion, brainstorming, option searching, and evaluation, Czachowski and his collaborators agreed that the use of Xenon-133 gas in conjunction with the patient’s ventilator and the Pulmonex system was the most highly viable solution. The Pulmonex system, which when used in the nuclear medicine department, safely captures exhaled radioactive Xenon-133 through a lead-lined trap. The hurdle was finding a way to capture the gas from the patient, contain it, and maintain the patient’s ventilator dependency, all while remaining in the CICU. Leveraging the expertise of Alvin Saville, RRT, Respiratory Education Coordinator at UPMC Children’s Hospital, a tubing adaptor placed between the patient’s ventilator circuit and the endotracheal tube was added. It successfully trapped the patient’s exhaled radioactive Xenon-133 inside the Pulmonex system, which ensured a safe environment for the patient, staff, and family. In April 2018, after months of development and testing, the successfully modified system was used for the first time on a patient in the CICU. Although they continue to refine the protocol, “to do the lung ventilation exam with no interruption of the patient’s physiological and physical environment in the CICU or elsewhere is quite an accomplishment,” said Czachowski. It has created a seamless process that is both safe and efficient. You can find the original announcement about the First Mobile Xe-133 Lung Ventilation Scan System in the United States here.